The first official flag of the Soviet Union was adopted in December 1922 at the first congress of the Soviets' USSR. 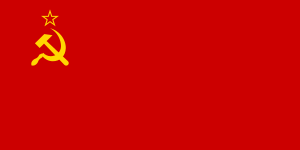 The red flag of the communist party was adopted as the national flag. On 30 December 1922, the congress Declaration and Agreement on the establishment of the USSR. Article 22 of the Agreement states: 'the USSR has a flag, coat of arms and a state seal.'. On 6 July 1923, it was decided that the flag was to consist of a red cloth with the state coat of arms of the Soviet Union in the centre. The unusual flag format 1:4 was selected. This flag was used however never to used very much and was only used officially for four months. The third meeting of the Exekutive committees of the Soviet Union changed the flag on 12 November 1923 into the more well-known version. The more common format 1:2 was selected. The state coat of arms was replaced by a gold sickle and hammer, and a red five-pointed star bordered in gold above them. Changes to the shape of the hammer and sickle and the shade of red were made in 1955. This design stayed the national flag until the break-up of the Soviet Union on 3 December 1991. ↑ Whitney Smith (2008). "Flag of Union of Soviet Socialist Republics". Encyclopædia Britannica. Retrieved 2008-11-05. ↑ Whitney., Smith, (1980). Flags and arms across the world. Smith, Whitney. New York: McGraw-Hill. p. 203. ISBN 9780070590946. OCLC 4957064.